Psychology professor Leila Takayama and a team of researchers at University of Wisconsin published a new study about the impact of telepresence robots on interpersonal communication. Politics professor David Gordon developed an important rubric using orchestration theory as a way to understand how cities can effect a meaningful response to climate change. 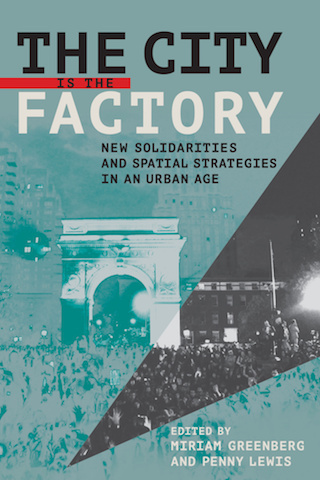 Miriam Greenberg co-edited The City Is the Factory: New Solidarities and Spatial Strategies in an Urban Age (Cornell University Press, 2017). The book's cover was designed by Julie Rogge, a designer in the Arts Division at UC Santa Cruz. Robert Fairlie co-authored one the first detailed studies to explore the transition from solo entrepreneur to an employer business. Fairlie found that contributing factors differ by race, ethnicity, and gender of the entrepreneur with immigrant and minority business owners taking the lead in job creation. “Immigrants have higher rates of hiring their first employee by the first two years than the native-born,” says Fairlie. Fairlie found that 44.8% of immigrant entrepreneurs are more likely to hire their first employee in the first year of business operations. Asian and Hispanic entrepreneurs are also more likely to grow their business operations through employees. While business assets can make a difference between solo entrepreneur and employee firms, it is the future potential resources of a firm that may be the most important factor in making the decision to hire staff. Fairlie found that startups holding intellectual property rights like a trademark, copyright, or patent are also more likely to hire an employee. How developing economies promote financial inclusion is an issue Nirvikar Singh discusses in a report for the International Growth Centre, a research center based at the London School of Economics and Political Science in partnership with the University of Oxford. Singh lays out some of the basic concepts surrounding financial inclusion, including access to banking, digital payments and financial literacy, as well as markets for health insurance, crop insurance, agricultural credit, small firm finance, and the widely discussed microcredit/ microfinance. Singh argues that financial inclusion is a complex and multidimensional concept. With a focus on India, Singh outlines several recent studies and draws lessons for policy-making and future research directions. “Important considerations that emerge from the overview are the significance of social and economic context, the need to consider behavioral biases connected to situations involving time and risk, the interaction of different dimensions of financial inclusion, the importance of details of policy design, and the limited understanding we still have of many of the factors underlying the functioning of financial markets,” writes Singh. Singh, who also holds the Aurora Chair in Sikh and Punjabi Studies, published an article that examines the difficulties of translating the Sikh sacred text into English. He also authored a chapter in Sikh Art from the Kapany Collection (2017, The Sikh Foundation & Asian Cultural History Program, Smithsonian Institution). Judit Moschkovich published two publications this quarter, one that examines how middle school students understand and describe graphs of motion about walking trips, as well as a study that that uses her previous research findings to describe how math teachers can use math word problems to increase access for English learners. “I think I’m maybe on my way to being an activist, but it is something that I would like to be and that I hope to be. But I’ll have to put a lot of work into it,” says Diana, a youth activist and interviewee in Jessica Taft’s latest article about how teenage girls’ view their journey into activism. Drawing on stories from Diana and other young political women in five North and South American cities, Taft shows how their narrative mirrors the “coming of age” trope and draws on popular narrative of adolescence as a period of self-development. Taft found that many politically-engaged young women portray their activism as “becoming” instead of “being,” a process Taft argues unwittingly dismisses and downplays their accomplishments. Taft also pointed out that these self-perceptions are also gendered. “The gendered quality of girls’ narrative [in the study] is confirmed by findings that white male youth activists more often construct themselves as radical teen superheroes,” Taft writes. After President Trump repealed federal support of the Paris Agreement, cities across the country are signing on to fulfill America’s pledge. From Ann Arbor to Austin, Miami to Mountain View, Watsonville to Washington D.C, cities everywhere are joining together to take aggressive action on climate change. David Gordon’s latest paper is an important rubric to understanding how cities can effect a meaningful, bottom-up response to climate change. Cities can set targets, develop plans, measure emissions, and undertake concrete policy interventions. Gordon urges that they can do that effectively by using orchestration theory. “Orchestration offers a potent means of theorizing governance relationships in instances where governors lack coercive authority or the capacity to assert ‘hard control’ over those of whom they seek to govern,” writes Gordon. Potential orchestrators can include city networks, private corporations, philanthropic groups, state governments, international organizations, environmental NGOs, and even international financial institutions. To understand and assess urban climate governance, Gordon lays out a framework (see image 2) that identifies how cities can galvanize their networks into action. How do emerging countries and developed nations negotiate climate action? 2017 Carnegie Fellow Sikina Jinnah explores this question in a peer-reviewed article about post-Kyoto climate negotiations at the United Nations Framework Convention on Climate Change (UNFCCC) between the 2007 Bali conference and the 2015 Paris Agreement. Focusing on China and the US, Jinnah examines how responsibilities for domestic climate action are shared. Who contributed to the problem? Who is contributing to the problem now? Who can afford to fix it? As Jinnah illustrates, these are some of the complex questions at the core of any discussion for climate governance. For example, while China overtook the United States as the largest greenhouse gas emitter, its contribution to the problem historically remains low compared to industrialized nations. This perspective influences the assumptions of who should act on climate change, acutely so for developing countries with issues of equity, economic growth, and sovereignty coming into play. Jinnah uses these discussions to uncover the important ways emerging nations can create normative change. Craig Haney, an expert in the psychological effects of incarceration, was featured in a Newsweek magazine article about the impacts of solitary confinement. “The longer they’re in it, and especially if they’re not sure when they’re going to get out, a range of negative psychological reactions begin to mount,” Haney is quoted as saying in the article. The New York Times featured Cam Leaper's work in the recent article, How to Raise a Feminist Son. The piece points Leaper's 1998 study that found that mothers talk more to daughters than sons, and also leverages Leaper's expertise about long-term effects of gender differences. Barbara Rogoff and her colleagues produced a new video that was voted second out of the 171 videos in the National Science Foundation 2017 Video Showcase. The 3-minute video is about the sophisticated collaboration of Mexican-heritage and Indigenous American children and their families–showing a key way of learning in these communities, according to Rogoff and her doctoral students Andy Dayton and Itzel Aceves. These families fluidly engage together toward their goal, reflects Rogoff in the comments section of the video. The video reveals cultural differences in how families work together that appear even at a scale of fractions of seconds. Mayan mothers and their two children usually engaged all three together, whereas middle-class European-American mothers and children seldom collaborated all together. They usually focused on one-on-one interactions, with one person left out, or conflicted in their interactions, or did not engage each other at all. “Not only is collaboration important for their own learning; their sophisticated collaboration provides a model of learning together for other children, as well as for teachers, program designers, governments, and the public -- all of us,” says Rogoff in the video summary, about the ways Mexican and Mayan families work together. The video also received recognition for its productive discussion. Thanks to new technology, people have more choices about how to connect with people at a distance, Instead, you can Zoom, FaceTime, and Skype yourself into a doctor’s office, lecture hall or conference room. With telepresence robots (pictured), you can interact more than ever before. Telepresence robots can improve interpersonal communication if they physically mirror the same nonverbal cues, says UCSC psychology professor Leila Takayama and a team of researchers at University of Wisconsin in a new study about robot-mediated communication. Body language is an essential part of interpersonal communication and plays a key role in establishing social relationships. Being able to mimic body orientation or nod a head are an essential cue that can impact communication. If you are remotely checking in to a meeting, a telepresence robots can be a physical way for you to interact and engage nonverbally. Water and poverty are intimately connected. Water can be both an escape from poverty but in some devastating circumstances, a descent into landlessness, joblessness and homelessness. Ben Crow examines the disparate ways poverty and water use interact, highlighting several complicated issues including the male bias of water management and deprivation initiated by infrastructure construction (for example, dams, canals, and irrigation systems can cause poverty through displacement and dispossession). Lindsey Dillon was interviewed for UC Berkeley's California Magazine on her work archiving public environmental data. In an administration that is abandoning environmental policies and agencies, Dillon is actively working to record public data that is at risk of being removed from public websites. “We live in a moment where we’re worried about this Orwellian disappearing of information,” she is quoted as saying. Dillon’s “data rescue” work was also profiled on the UCSC Newscenter. Miriam Greenberg co-edited The City Is the Factory: New Solidarities and Spatial Strategies in an Urban Age (Cornell University Press, 2017), a volume about how streets and squares of cities across the world have become emblematic sites of contentious politics in the twenty-first century. Greenberg and her collaborators explore the ways cities can function like a factory, producing profit and also ideas, politics and justice. Undocumented youth are a vital base of the immigrant rights movement. Their grassroots efforts helped pass important pieces of legislation, including the DREAM (Development, Relief, and Education for Alien Minors) Act and DACA (Deferred Action for Childhood Arrivals) - two bills that offer undocumented young adults the right to live, study, and work in the United States. Curious about how this precarious population mobilize politically, Veronica Terriquez surveyed Latino young adults in California to better understand how legal status and civic commitment interact. Terriquez discovered civic organizations make a long-term impact for political engagement with this community. “While this study suggests that legal status had inconsistent effects on political participation among the general population of Latinos, it also emphasizes the importance of civic organizations–particularly those that expose young people to formal political processes–in prompting political participation among undocumented immigrant and other Latino young adults,” Terriquez writes. Terriquez also underscores the the critical role civic organization play in influencing activism from adolescence into early adulthood. She likens it to “scaffolding” for later political participation. In 2016, the powerful fumigant methyl bromide was finally phased out from California’s strawberry fields. In her latest report on the strawberry industry in California published in California Agriculture, Julie Guthman explores how growers production practices adapted to the loss of a chemical they relied on for decades. She finds that land access and cost may result in an increase use of fumigation.